HCM City (VNA) – Encouraging signs for rice exports after a down-period have boosted the Vietnamese rice market. 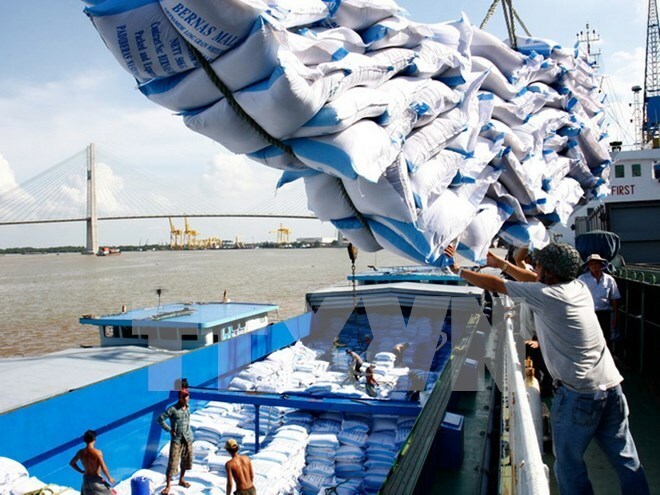 According to the Vietnam Food Association (VFA), the country earned free-on-board (FOB) export value of more than 701 million USD from shipping 1.6 million tonnes of rice to foreign countries in the first four months of the year, down 14.2 percent in volume and 10.6 percent in value from the same time last year. However, Vietnamese rice exports recovered somewhat in April after a big slump in the first quarter. Exporters sold nearly 510 tonnes of rice abroad last month on FOB value of 220 million USD, a year-on-year increase of 14.6 percent in volume and 9.75 percent in value. VFA Chairman Huynh The Nang said that the Philippines plans to import 250,000 tonnes to augment its buffer stock for lean months from July to September. Some exporters have won tenders to supply 40,000 tonnes of the grain for Malaysia. Meanwhile, 40,000 tonnes of Jasmine rice was shipped to Iraq. Also, Bangladesh plans to buy 600,000 tonnes, including 50,000-100,000 tonnes of white rice with the remainder parboiled rice to offset crop damage caused by torrential rains. Lam Anh Tuan, director of Thinh Phat Food Co., Ltd, predicted a bright future for rice exports. He said that the fall in Thailand’s rice inventories will help the Vietnamese and global rice trade recover. Furthermore, Vietnamese enterprises are more competitive than their competitors as each tonne of Vietnamese rice sells for 350-360 USD while Thai, Indian and Pakistani rice is purchased at more than 390 USD per tonne, he added. The VFA said that drop in rice price has triggered an increase in the number of rice export contracts. However, enterprises are unsure if the positive signs are enough to significantly boost Vietnamese rice exports, with worries of being unable to meet demand from foreign countries rife.